You made our wedding such a memorable experience. I loved how the guests were entertained while they waited for dinner. Everyone really enjoyed themselves and had a great time! Never a dull moment. I would definitely recommend you to others. I have been to other weddings and by far you are the best!! Thank you so much for a job well done!! 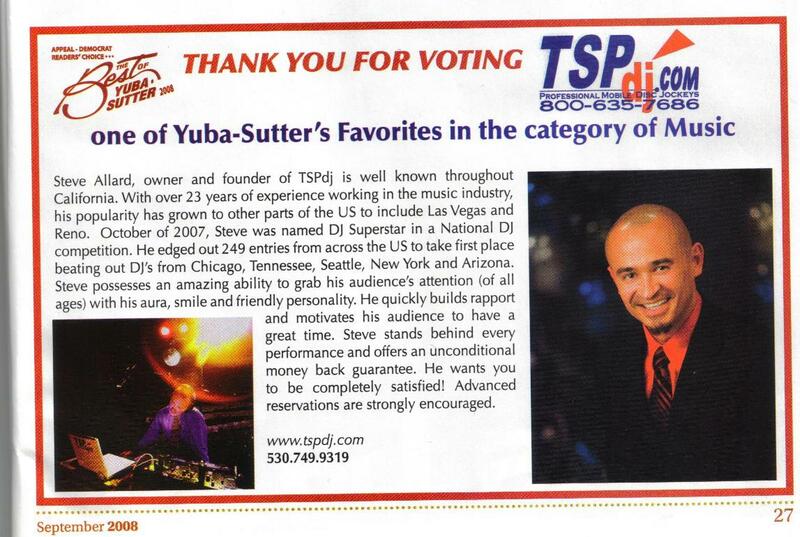 Fans of the Yuba Sutter area voted TSPdj (Ruethai Steve Allard) best of Yuba Sutter. “We’ve never had a DJ take first place in the music catagory before…” says a sales representative from the Appeal-Democrat. Ruethai Steve Allard of TSPdj competed in a national competition hosted by Wedj.com in October, 2007 performing “Best New Game” for weddings. Of the 249 attendees, Ruethai was voted top performer beating out other DJ’s from New York, Tennessee, Arizona, Seattle and Chicago. The competition took place aboard the Carnival Cruise ship in conjunction with the National WEdj convention. Wedj solicited contestants to submit a written description of their “Best New Game” for weddings. Ruethai was chosen one of six finalists to perform at the conference in front of fellow DJs and conference attendees. 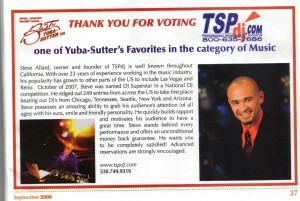 CONTACT THE AWARD WINNING TSPDJ.COM TEAM FOR YOUR NEXT EVENT!